A brush fire briefly threatened homes near Gillespie Field airport Tuesday, prompting a few evacuations and road closures and sending a thick column of smoke into the air over state Routes 52 and 125, authorities said. The blaze erupted for unknown reasons just southwest of Forester Creek in western Santee about 3:30 p.m., according to sheriff’s deputies. 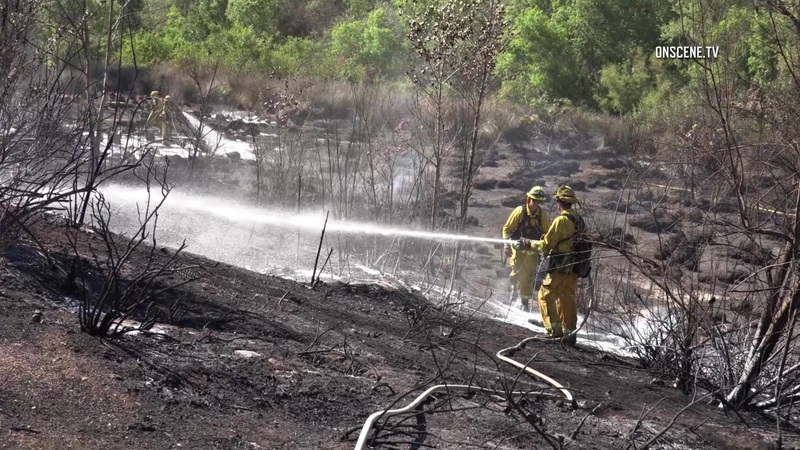 Deputies cleared people out of about a half-dozen nearby homes and closed stretches of Olive Lane and Prospect Avenue as firefighters began dousing the flames, said Lt. Amber Baggs of the San Diego County Sheriff’s Department. Shortly after arriving in the area to help extinguish the blaze, a Cal Fire helicopter crew had to land the aircraft for a time due to the presence of a drone being illegally flown over the burn zone, the state agency reported. It was not immediately clear who was operating the device. Crews had the fire under control within 90 minutes.